Certainly a feast for the senses, this bag of organic Spugnole Sponges from Marella is excellent at catching sauce in its frilly lines. Made with organic and all-natural ingredients, its ideal sauce is some hearty meat sauce such as ragù. But if you prefer something less hearty, you can also serve it with pesto or pomodoro sauce, or simply toss it with butter and Parmesan cheese. Indeed, you can serve this pretty frilly pasta with any of your favorite sauces. Spugnole got its name from one of the most famous edible mushrooms in the world. In fact, it is Italian for morels, from the Italian word “spugna”, which means “sponge”. 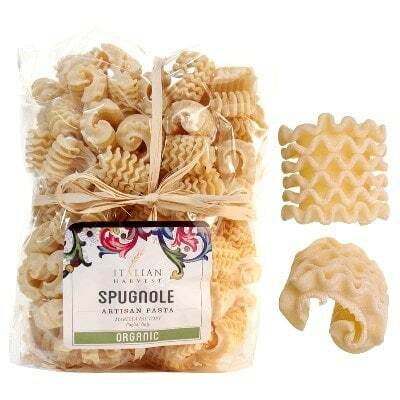 A popular pasta with many chefs, this pasta expands when you cook it, which makes it great for preparing hearty meals. Curious? Order a bag and try it out now!